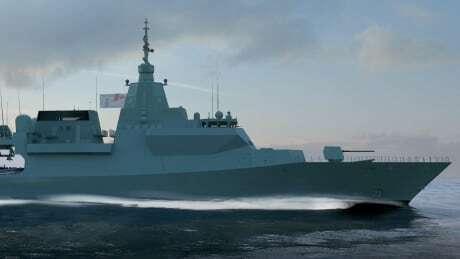 A group of companies led by multinational defence giant Lockheed Martin has been selected as the preferred designer for Canada's next generation of warships, the Liberal government said Friday. The announcement represents a significant step forward for the long-anticipated $60 billion program to replace the navy's aging fleet of frigates. "The Canadian Surface Combatant project is the largest, most complex procurement ever undertaken by the Government of Canada. These ships will form the backbone of our Royal Canadian Navy and will be Canada's major surface component of maritime combat power for decades to come," Public Services and Procurement Canada said in a press release. Procurement services and defence officials say this is not the final step; they will now enter into negotiations with the winning bidder to confirm it can deliver everything promised in the complex proposal. The company must now go through a "due diligence process," which includes further negotiations over intellectual property rights, combat systems performance assessments and a review of the company's "financial capability to deliver the project," the government said. The federal government does not expect to award a final design contract until next spring. It could be 2023 before construction actually gets underway at the go-to yard for warships — Irving Shipbuilding of Halifax. André Fillion, the assistant deputy minister of defence and marine procurement at Public Services and Procurement Canada, said if the federal government is not satisfied that the top bidder can deliver, it will open negotiations with the second-place team of companies. Alion Science and Technology, along with its subsidiary Alion Canada, had submitted their proposal based on the Dutch De Zeven Provinciën Air Defence and Command (LCF) frigate. Navantia, a Spanish-based company, headed a team that included Saab and CEA Technologies. Its proposal was based on the F-105 frigate design, a ship in service with the Spanish navy.